This Mango Panna Cotta is smooth and creamy right down to the last spoonful! It’s a gorgeous dessert that will wow your guests at a party, and it also works perfectly as a homestyle pudding for mango lovers. The best part? You can make it up to several days ahead of time. Plus video tutorial! Ever tire of the same old desserts? Don’t get me wrong, I love cheesecake and tiramisu as much as the next person. But sometimes we all need some new foodie experiences to inspire us, and this mango panna cotta will do just that! 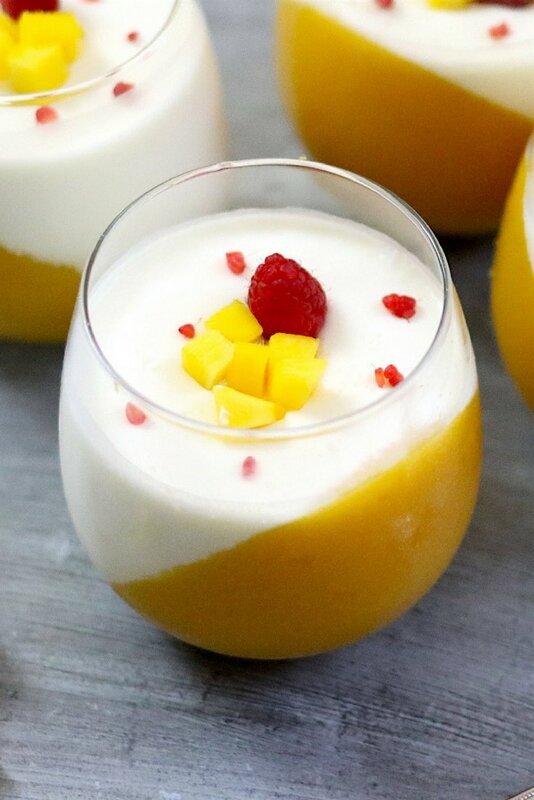 The tartness of the mango balances perfectly with the creamy panna cotta. Panna cotta is one of the most popular desserts in Italy, where it translates as cooked cream. Sometimes panna cotta served plain, and it’s often flavored with anything from lemon or strawberries to espresso or chocolate. 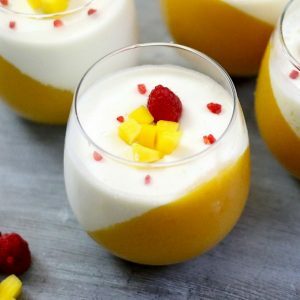 We’ve served this mango panna cotta at dinner parties with rave reviews, and one reader made it successfully for a wedding shower. It’s a stunning, two-tone dessert that tastes and good as it looks! There are two parts: the mango puree, and the vanilla panna cotta itself. To make it, start by peeling ripe mangos. Then cut the flesh into chunks and add them to a blender or food processor. Pulse for 5-10 seconds and voila! You should have a nice smooth puree, but if not just pulse a bit longer. Because the mango puree needs to support the vanilla panna cotta on top, we’ve used unflavored gelatin powder as a thickening agent. Soften the gelatin by sprinkling it on top of some mango juice and waiting a few minutes. 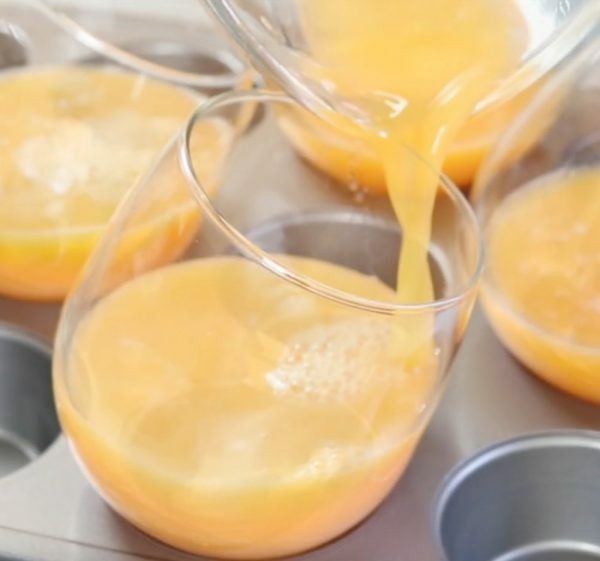 Once you’ve mixed the mango puree into the thickened mango juice, you’re ready to pour the blend into your wine glasses. Our favorite hack for doing this is to use a muffin tin with a hand towel underneath to stabilize the glasses on an angle. Then let it chill in the same position for 2 hours to set. Be careful not to upset the muffin tin while you’re transporting it over to the fridge! The final step is making the panna cotta mixture, which is essentially milk, cream, sugar, vanilla and gelatin cooked over low heat. Once it’s ready and cooled to room temperature, pour it over the mango mixture to fill up the glasses. You can garnish with a few chunks of mango and raspberry. In terms of serving, you can leave the panna cotta in the refrigerator for several days covered in plastic wrap until ready to serve. The flavor actually improves with time. If you prefer a lighter variation, you can directly substitute half and half milk for the heavy cream. The recipe may be slightly less creamy, but will still be delicious. This Mango Panna Cotta is smooth and creamy right down to the last spoonful! 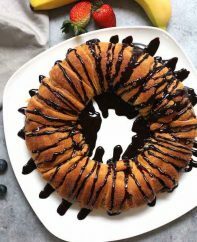 It's a gorgeous dessert that will wow your guests at a party, and it also works perfectly as a homestyle pudding for mango lovers. You can make it up to several days ahead of time. Plus video tutorial! In a small bowl, add mango juice and sprinkle gelatin on top. Wait 5 minutes for gelatin to soften and then mix with a spoon. Microwave mango juice for 1 minute on high power. Stir again for one minute until gelatin has dissolved. Set stemless wine glasses or tumblers in a muffin tin on an angle. If the glasses slide, place a tea towel underneath to stabilize. Mix together the mango puree and mango juice mixture. Pour into glasses to a half inch below the rim, and chill in position at least 2 hours to set. In a small saucepan, add milk and powdered gelatin and wait 10 minutes. Remove saucepan from heat and stir in the cream, vanilla and salt. Once at room temperature, pour into the glasses enough to cover mango. Chill for 1-2 hours until set. Garnish with optional raspberries and diced mango. Serve and enjoy! Editor note: Originally published Nov 15, 2016 and updated Sept 18, 2018. Ingredients listed are incorrect re gelatin. Shows teaspoons but should be quantities in tablespoons as shown in the video. Hi Garth, Thanks, I just provided more detail in the recipe to convert between the different measurements. Hope that helps! The video says 2 tbsp gelatin and the written text says 2 tsp. and it’s not clear if the cream mixture can be poured over the mango mixture before it has set. Great concept but the gelatine quantities are way off. 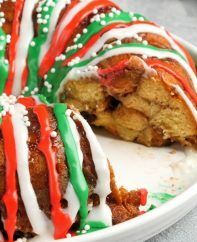 (There’s even a contradiction between the quantities in the ingredients list and the quantities mentioned in the directions portion.) 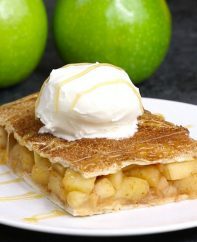 Didn’t set until more gelatine was added – but eventually got there, and the flavour and look of the dessert was great. In future I will use the gelatine quantities that Donna Hay uses for peach panna cotta in her Classics vol 2. If using frozen mango pulp, what is the equivalent amount? 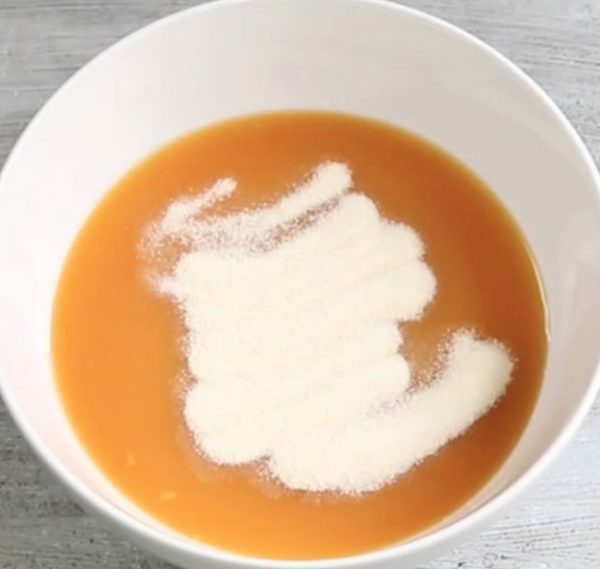 Hi there, Thanks for your review and I added the volume amount of mango puree (2 cups). Hope that helps! Hello – looks lovely!! For gelatin or agar agar, please is it one teaspoon (recipe) or one packet (video)? Hi Kathryn, Sorry to hear it didn’t turn out. I updated the recipe with more detail around the gelatin and hope you’ll try again. I made 4 batches of this dessert in the past two weeks because it tastes great to me, my family, and friends. I followed the written instructions and everything gel’d fine. For my taste preference, I prefer the mango purée to be slightly firmer than this recipe, and the panna cotta a bit softer. For this tweak, I moved 0.5 pkt of Knox gelatin from the panna cotta part of the recipe into the mango purée (I.e. just 2.5 pkts into the milk/cream mixture, 1.5 pkts of gelatin into the mango part). – don’t overheat / boil the milk. You don’t want milk skin. Gelatin will continue to dissolve while panna cotta cools, so it’s ok to have small lumps when removing pot from heat. Just keep stirring. – because of the gelatin, be careful when transferring your mixtures into your serving cups. Very easy to mess up the sides of your serving glasses. The look of this dessert is great but although I measured carefully both the mango and pannacotta were rubbery ie too much gelatine, so I was surprised to read that for some people it did not set. Could envelopes in the UK contain more than in the USA? My beautiful desserts were left uneaten. We topped them with mint and pomegrante seeds for Christma.Christmas. Hi Adrienne, So sorry to hear that and thanks for your feedback. I suspect the UK envelopes are different, or at least the how the gelatin is formulated. If you try again I’d recommend halving the amounts and checking the package directions for more information.